"We seek to alleviate the burdens of poverty by providing education, job opportunities, food, and other resources for families and children in Madagascar, through the grace of God." "Father of the fatherless and protector of widows is God in his holy habitation. God settles the solitary in a home; he leads out the prisoners to prosperity.."
Some things that God calls us to are clearer than others. Growing up in Antananarivo, Madagascar and seeing first-hand the scars of poverty in the form of disease, depression, starvation, death and more, Fugain was never satisfied with the poor quality of life that his friends and family experienced. Since he was young, God instilled in him a deep sense of justice and a passion to help Malagasy people stand on their feet, and to make something more of themselves than what they have been given. Brittany was a 22 year old short-term missionary in Madagascar when God gave her a vision of opening up a school for poor children and taking care of orphans. 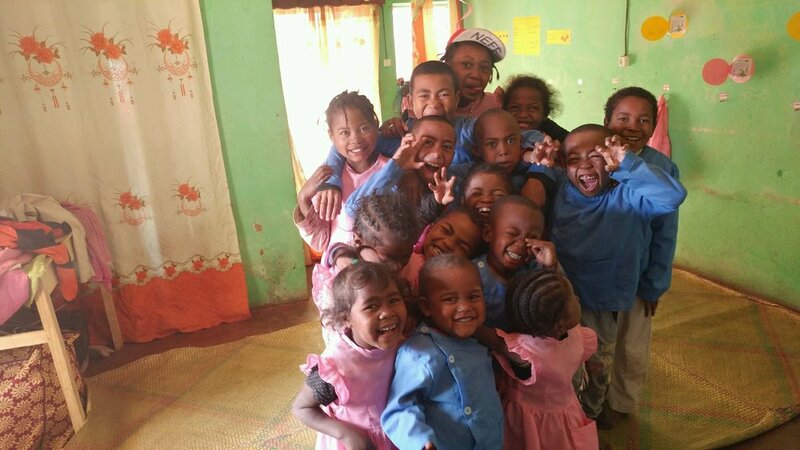 As an English teacher of Malagasy students, she was disheartened by the fact that not only were many of them coming to class hungry, but all of them possessed gifts and talents that might never be used as God intended, because where there is poverty, there is also a lack of resources and opportunity. Redeemer's Friend was birthed out of a partnership of two friends, who though growing up in very different circumstances, had a passion to care for poor families and children. With a shared hope of showing the love of God while restoring a sense of dignity and purpose to people who have never had the opportunity to live as God would desire, Redeemer’s Friend became an avenue to accomplish His mighty work. Madagascar makes the top ten list of poorest countries in the world. Though it is rich in natural resources and biodiversity, Malagasy people barely reap any of the benefits of what their land produces. Like many other third world countries, their government is corrupt, and after gaining independence from French colonization, the economic state of their country was left in shambles. If you were to visit Madagascar, it would be common for you to see beautiful people in desperate situations, driven by the sole purpose of survival. Disabled and crippled people, unable to get the medical attention that they deserve, are taken advantage of by their families and left on the streets to beg for money or food to bring home. Orphaned children, left in this world alone from diseases that could be prevented or cured easily in a first world country, seek out provision through begging and prostitution. In certain areas of Madagascar, infants are left to lay in dirty rags on the street because their parents are either deceased or unable to care for them. These are all things that you may recognize as common attributes of a third world country, but please do not allow yourself to become desensitized. At Redeemer's Friend, we are driven by the fact that God creates everyone in His image and has called every Believer to care for the poor, the widow, and the orphans (James 1:27). Let's work on behalf of others who are in need of provision and a tangible expression of God's love. We could talk about the impact of a dollar. Just one U.S. dollar! In Madagascar, one U.S. dollar equals about 3,000 Ariary. For a family of five, that buys them the vegetables, beans, or meat to compliment their rice for one day. All the extra nutrition that they need for one whole day. The impact of $5 would result in 15,000 Ariary, and is what it costs to go see a doctor and receive medical attention. $10 is 30,000 Ariary and could buy a child a pair of shoes, some pants, a tee-shirt, and a sweater to make sure that the little one is nice and warm during the winter and would not step on any glass while walking on the dirty road. $20 is 60,000 Ariary and buys the side-dishes for 20 children's lunches for one week. Even just one dollar could contribute immensely to the health and well-being of a child or family's life. Don't underestimate the power of just $1! Also, don't underestimate the power of the Gospel. We know and recognize the needs of the poor. We also know that the greatest need in anyone's life is Jesus. Fitted Feet is a non-profit Christian organization whose purpose is to inspire, equip, and empower believers to share the light of the Gospel, express the love of Jesus Christ, and minister to those in need. The concept for Fitted Feet began when Mary Peck, founder, was radically changed when sent on a short-term mission trip to Eastern Europe by her church, Chino ValleyCommunity Church, Chino Hills, California. Her experience opened her eyes to God’s amazing grace and transforming power through service and evangelism. She returned from the trip with a passion to share her journey and encourage others to encounter the same. More importantly, she wanted to help equip other Christians to follow God’s ultimate call to spread the Good News and bring hope to the world. Go into all the world and preach the good news to all creation. Mark 16:15. The organization immediately began to develop and mobilize resources for Christians to use. A Faith Aid Car Kit was created to help believers minister to homeless in local communities. Information on evangelism and service was gathered and offered to many in neighboring churches. Fitted Feet continues to strive to inspire and empower Christians to share their faith and minister to wherever God calls them. Fitted Feet is proud and blessed to partner with Redeemer’s Friend. Redeemer’s Friend reaches out to the neediest in Madagascar, offering families sustenance, education, empowerment, and hope. This enterprise requires many resources. Fitted Feet provides the avenue through which these resources can be collected, developed and used to support this life giving program.